On my visit to England I had to experience the gardens of Hampton Court. The property abuts the River Thames. I walked down to the water and could imagine centuries ago summer visitors arriving by boat. Formality still in Hampton Court today. In Hampton Court we see a sixteenth century English version of Le Notre’s style. In th next century, the seventeeenth, England would change its garden style and launch a movement called the picturesque, then the gardenesque, and later in the nineteenth century the Romantic. Each of these styles began as an attempt to design in a different style from the formal, symmetrical look, while sometimes incorporating a bit of symmetry. 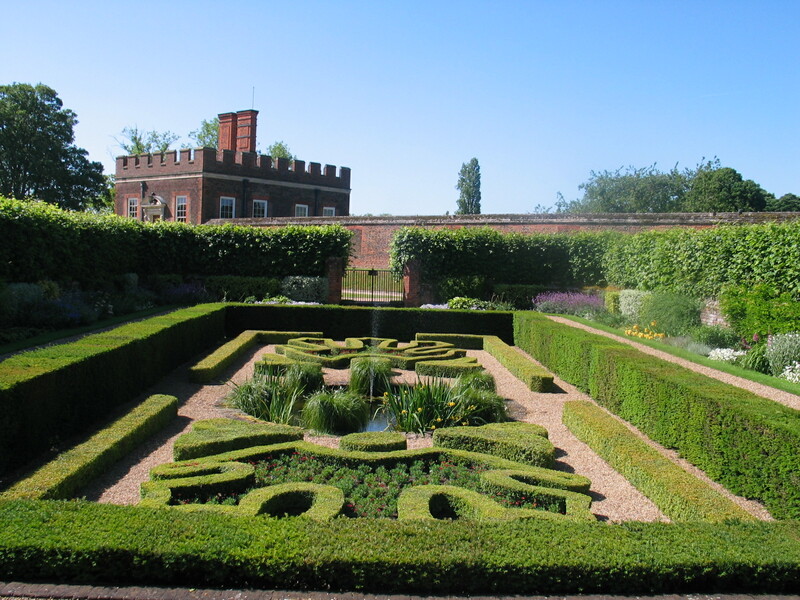 Hampton Court stands as an early version of the English landscape garden when the landscape design took a more formal look.